Does this skull bring ruin, or is its name a reference to its own ruined state of being? None can say for sure, but what is certain is that this Ruination Skull Ring is a dramatic accessory that goth guys and girls can to enjoy. Ruin and destruction are two of the central themes in this piece of jewelry, and defiance is a third, as this ring is resolved to stand solid and firm, even as its form seemingly prepares to crumble. 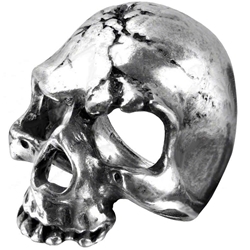 Its form is that of a classic gothic skull, rendered in attractive fine English pewter, which gives it impressive detailing as well as a striking luster that is bound to attract attention. Cracks, both narrow and large, adorn the surface, making it look worn and damaged, as if time has more than ravaged its surface. The ring also features hollow eye sockets, which allow glimpses of your finger to be seen whenever you wear the ring. It is available in several different sizes. Want to touch up your style with something that is dark, gothic, and highly impressive? Then slip this Ruination Skull Ring onto your finger and awe the crowd with the eerie appeal that can be found in devastation and ruin.